Hello! Welcome to the final day of JustRite Stampers August release! Today we are introducing CL-02165 Be Strong, a clear set (yes, you read that right ... it is JustRite's first clear set!) of 21 frames, images, ribbons and sentiments. 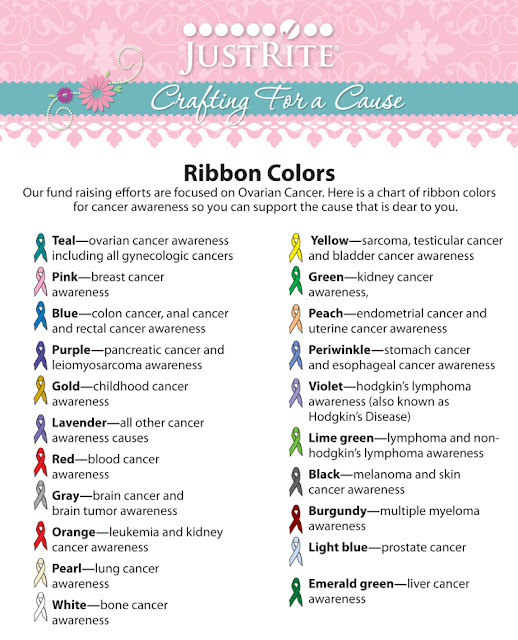 In an effort to find an early diagnostic test or screening tool for Ovarian Cancer, JustRite Crafting For a Cause will donate 20% of the sales from Be Strong (introduced tomorrow) and Strength and Courage in 2011 to Ovarian Cancer Research. To learn more about the symptoms of this “silent killer “ visit Ovarian Cancer National Alliance. 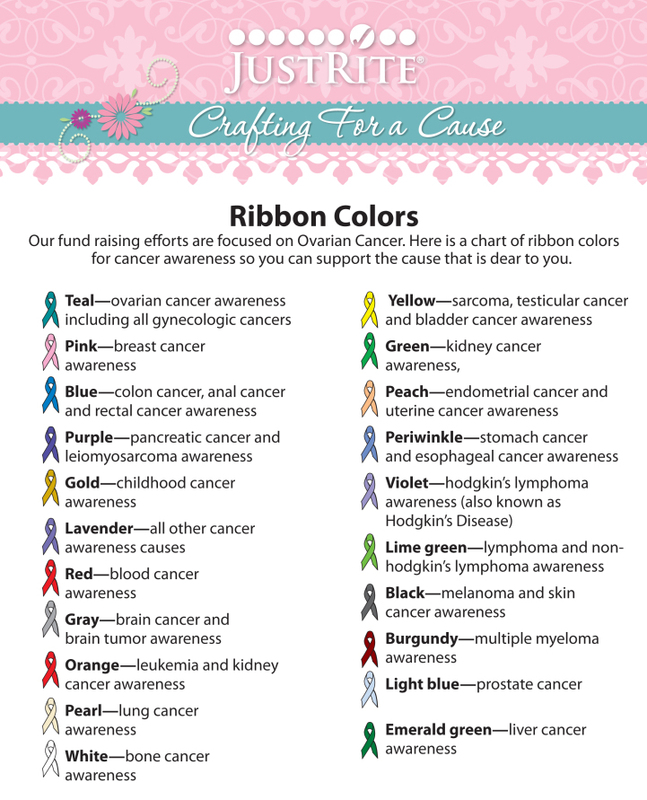 My card is in honor of my brother-in-law who went through treatment for prostate cancer last year. I am thrilled to report that he is doing well and is now cancer-free! I created my own background paper by stamping and clear embossing the ribbon on a sheet of vellum, then I stamped a few of the sentiments (Faith, Hope, Love) around randomly. For my main image, I stamped and colored the ribbon, die cut and framed and otherwise kept my layout fairly simple so I wouldn't cover up too much for the background. Accessories: Markers (Copic), Clear embossing powder, Seam binding, Foam tape, Thread, Sewing machine. Love the idea of creating your own background paper, Stephanie! What a super card! Blessings and congrats to your brother in law! Simply fabulous! and creative! What a great set! Love how you used the stamps to create the backround paper as well. Beautiful. Great news about your BIL cancer free Stephanie :) Such a wonderful card! 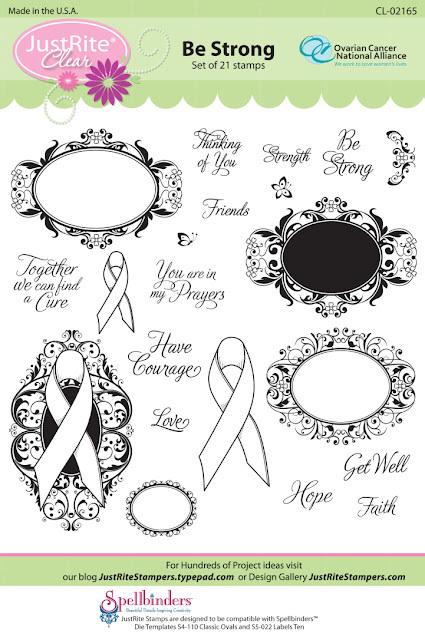 Love your custom stamped background and your beautifully stitched oval! Mad skills GF :) Hope you have a great weekend! An amazing card - love the background and the central ribbon image is lovely. So pleased to read that your brother-in-law is making a good recovery! GORGEOUS Steph!!! 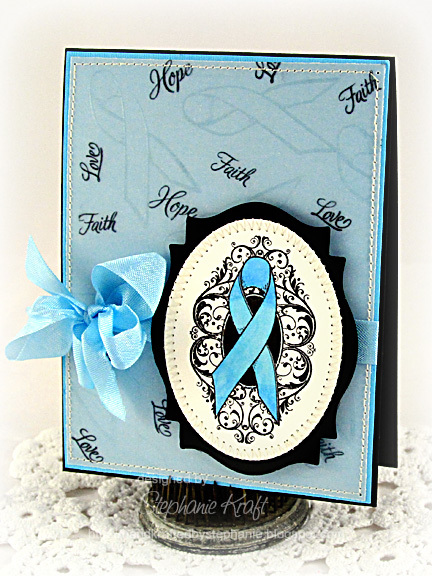 Love the pretty blue ribbon and the stamped background!